This is a Flickr badge showing public items from the Artist Class group pool. Make your own badge here. Submit a Tutorial to Artist Class! Artist Class is an online collection of 12 project tutorials, created by 12 different artists. Each session takes place over 4 weeks, on a members-only blog, and there’s something new every day. Daily posts will include instructions for one dozen individual projects plus additional, bonus links, images and mini-projects. Students receive quality in quantity: project tutorials filled with great pictures and information designed to get creative juices flowing and introduce new skills. There’s a lot of material available during each session, so every tutorial is downloadable to be saved or printed. Artist Class tutorials are flexible enough to provide lots of information for beginners, as well as fun, beautiful projects for experienced artists. Each Artist Class session takes place on a private, members-only blog. There are daily posts throughout the 4 week session. The blog is open for 3 months to allow plenty of time to save material, ask questions and share pictures of your creations. The price for each 4 week session is $59. It's the last week of the Garden Party session of Artist Class; just more 3 projects to go. Registrations are open through Saturday, May 1st. All of the projects and material will be available for 6 months, so there's still lots of time to do projects and download materials. Artist Class will be back later this year. If you can't join us for this session, I hope you'll watch this space for announcements this Summer. There are 3 upcoming tutorials to finish out the session, each one is a great addition to a really fun session. On Monday, Nancy Maxwell James presents her Bird's Nest Cigar Box, a charming assemblage perfect for celebrating the spring season. It begins with a cigar box and utilizes many of the art materials you probably already have at home. Wednesday's project is Sandy Babb's Fairy Garden Picks, designed to decorate cupcakes or any small space. The picks use lots of garden themed materials to create the look of a woodland forest. Sandy even included an adaptable cupcake recipe to go with your Fairy Picks. The entire project is perfect for your next Garden Party. On Friday we'll be treated to Lesley Venable's Tailored Tags, complete with transfers, sewing, ephemera and ink. The techniques for these beautifully layered tags are taught by Lesley at events throughout the States. She's sharing her techniques for the Garden themed tags in an Artist Class tutorial, complete with images and voice-over. I hope you'll join us this week, to get all of the projects already presented, and to enjoy our latest. Registrations are open through Saturday, you can sign up HERE. We're starting Week 3 of the Garden Party session of Artist Class, and the stunning projects just keep coming. Today we're being treated to Mona Moore's cheerful paper flowers and decorated bottles. These fast and fun decorations make a great gift for you or someone special. They're also a green way to mix up left over papers and create something new. Wednesday's project is Sandy Camarda's Family Nest Assemblage, a really special piece that allows you to display favorite family photos in a completely new way. Birds and nests are perfect this time of year, and this project will be a beautiful decoration for your home. On Friday, we get out the drill and assemble Nikki Mans' Silverware Wind Chimes. These chimes use your vintage silverware pieces to make a little magic in the garden - they sound wonderful. I've seen the quick tutorial and there are fewer steps than you think - you'll get a lot of compliments and a major sense of accomplishment. There are a little less than 2 weeks left to sign up for this session of Artist Class, so if you've been considering it, there's still time to join us. We have some great projects coming up next week, and registrations are open so you can join in. Recently, Lilla LeVine sent me some more pictures of her Embellished Fabric Book, so I thought I'd share one of the inside spreads with you. Every page in the book is fabric, not just the cover. Lilla includes many of the images she used in the book so you can print them on fabric to use too. Also next week you'll receive a great tutorial from Tina Jensen on making a paper and fabric flower garland. So perfect for this time of year, it's a nice way to use pieces left from other projects, or to coordinate with other pieces in the same room. Finally, Beth Leintz will decorate our tea party tables with a charming Spring Centerpiece tutorial. This one is very adaptable, and Beth provides lots of inspiration and suggestions, along with images you can use. This project can actually be place card holders when you make them in multiples, or make a good group activity with each person making their own. Please join us in Artist Class where we're just getting started. You can join us at any time - you'll still receive all of the same content. Registrations are open now. It's time to announce our 12th project. It's from returning artist Tina Jensen - this gorgeous Flower Garland. Using cardboard, tea dyed coffee filters, different fabrics and a bit of lace and old paper, we’ll create a beautiful and romantic garland – a sweet and shabby chic decoration for your home all year round. Tina is 48 and a self taught artist living with her husband in Denmark in a very small town half an hour drive from Copenhagen, the Capital. She has two grownup kids - a boy and a girl. She has been designing and creating artist bears since 2001. Besides the bears she has a passion for all things old - old books, vintage lace, old buttons - you name it, and she loves to create old fashioned and vintage inspired decorations and stuff. This past year her work was publicized in Somerset Home. To register for The April, Garden Party session of Artist Class, and receive all 12 of the projects plus all the extras, go HERE. Lisa McIlvain brings Artist Class a perfect Mother's Day gift. This tattered textile collage is a tribute to a Mother's love. Lisa's tutorial demonstrates how to transfer images, layering them onto fabric and lace to create a lovely hanging art piece. Join Lisa as she shows us how to assemble this feminine piece, so perfect as a gift for a loved one...or for yourself! I'm a stay at home mom & married 14 years to my best friend & biggest supporter. I studied fine art at Southeastern University in Louisiana, & have a background in marketing & visual arts. Working in mixed media keeps me sane while being a stay at home mom to my 4 year old triplets. My art is inspired by the exploration & excavation of my past. Sometimes I feel like an archeologist, but instead of cataloging my artifacts, I alter them & give them life. Visit Lisa's blog, Tarnished and Tattered, and her Tarnished and Tattered Etsy shop too. The April Garden Party session of Artist Class will include a great tutorial for this wonderful architectural birdhouse and the delicious chippy paint process used to give it that natural stucco and rust appearance. Imagine going to your favorite flea market and finding an old stucco birdhouse that’s been created from found architectural pieces that have that aged chippy appearance we all love. That is what we are going to create, and the techniques you will learn can be applied to many other projects as well. The birdhouse brings the garden indoors with it's natural finish and bird's nest & egg detail. Adaptable for other wood pieces, this chipped paint technique is a combination of the right materials and these easy to follow instructions. You'll soon be using it on all of the wood in your house! Karen Valentine has been creating art of one kind or another her whole life. Her artistic point of view usually involves vintage elements or items made to look old and worn. She describes herself as a “modern girl with a vintage heart” and that certainly is reflected in her creative style. Karen is new teaching but is very excited about sharing her favorite how-to’s with all of us. You can visit Karen's blog, My Desert Cottage, for more great art, garden and home ideas. Using plain shipping tags, simple tape transfers and either a sewing machine or a needle and thread we will create beautifully layered and tailored tags. This is the perfect project to use up those little bits and pieces of paper ephemera and other scrap embellishments that have been collecting in your studio! These tags make the perfect adornment to a gift, as decorations for a vintage style Christmas (or other holiday) tree or simply tied to a lamp switch, armoire knob or as additions to your altered books. Lesley is a self taught mixed media, collage, assemblage artist who lives in Roanoke, Virginia with her husband and their furry family which includes three dogs and two cats. She has taught at Art Is You and at Art & Soul in both Virginia and Oregon. She is currently scheduled to teach in 2010 at Artiscape in Ohio, Art & Soul Hampton, Lisa LaRosa’s Inspirational Retreat in California, KC Willis’ Art Studio in Colorado and at Art Is You. 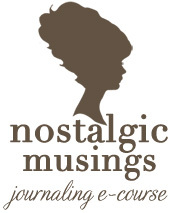 She also has online classes scheduled at My Creative Classroom and has begun “The Art of Altering”, a NING group, that offers free vintage images as well as online classes (upcoming). Her artwork has been published in the Artitude Zine, Somerset Gallery 2008 and Somerset Weddings 4. She is a co-author of “Exploring the Latest Trends in Mixed Media Arts Volume I” and a contributing artist in Volume II. Two of Lesley’s fabric collages have also been chosen to appear in this Summer’s issue of Sew Somerset. Sandy Babb is joining us once again for Artist Class...and this time she's bringing cupcakes! Well, not actually bringing them to your house, but she'll be sharing a 5-in-1 cupcake recipe with us. Take a look at the picture for a glimpse of these sweet little favors, an unexpected touch for your next garden tea party. For a look at Sandy's beautiful art, please stop by her blog, Quill Cottage. Another great Garden Party project, from Mona Moore, is two-part project. First, we’ll alter an old bottle or even a mason jar with clip art and pages from old books. Then we’ll fashion pretty paper flowers from wire, old buttons and leftover bits of scrapbook paper, old books, old maps, whatever. Mona Moore is a retired newspaper reporter and editor who lives in southern New Jersey. She makes jewelry, dolls and crafts for local gift shops and enjoys teaching craft classes. She has had work published in Somerset Studio magazine. Sandy brings us a marvelous Springtime assemblage you'll create representing your family. It's just perfect for spring and a lot of the supplies can be found just outside your door. This piece is customizable in many ways, and Sandy will show additional embellishment and personalization ideas. Sandy says: I am a full-time mom to 3 children and enjoy making art -as it is my little escape. I love to go 'junking' at Antique Markets and making art with my vintage found objects. I am fascinated by vintage dolls and like to use them a lot in my art. Visit Sandy's blog, Sandy's Creations, for more beautiful creations, and her Etsy shop, Distressrelief for art and vintage finds. Nancy brings us this beautiful shabby altered shrine, a perfect mix of nature, images and assemblage. The piece uses a vintage cigar box as a base and is very customizable. Nancy Maxwell James is a mixed media artist who resides in Hamburg, Michigan with her husband Steve and their three fur babies. She is also the Mama to three children who are now young adults. Creating allows her soul to be fulfilled and she loves spending time in the studio. Her art and written work has been featured in various Stampington publications and her blog Sugar Lump Studios offers challenges, tutorials and rubber stamps. To learn more, visit Nancy at www.sugarlumpstudios.com. Corinne brings us this charming toy, really too pretty to pass on to the kids. It's a cone puppet toy, otherwise known as a pop-up puppet, a type of puppet which became popular in the Victorian period. Corinne did this sample as "Alice down the rabbit hole" - a perfect subject for a pop-up puppet, as it looks like Alice is falling down the rabbit hole when the dowel is raised and lowered. The tutorial will show more options for decorating your puppet, including fairies and garden themes; many images will be provided. Corinne is a mixed media artist living near Toronto, Ontario, Canada. She has an Honours B.F.A. in theatre design from York University in Toronto and completed post-graduate theatre design studies at the prestigious Bristol Old Vic Theatre School in the UK. Her mixed media artwork has been published in the books Artist Trading Card Workshop, and Good Mail Day, and in various Somerset magazines. She was a featured artist for Our Sweet Marie zine. To see more of Corinne's projects, visit her blog, 100 Pretty Things. Join Nikki Mans in making this terrific wind chimes from discarded flatware. Assemble forks, spoons and more to create a one-of-a-kind addition to your garden. This project is a great way to use the stray pieces in your silverware drawer, or a lovely chance to display those tarnished treasured pieces. Grab a drill and get out of your comfort zone to make something truly special. Nikki is a crazy craft-monster who mostly loves working with vintage items & supplies. She’s also a pastor’s wife, mommy of 2 kidlets, a newspaper columnist, photographer, a blogger, a giggler, & an all-around silly gal. She’s been featured in Glamour Greece, Artful Blogging, the 'Photojo!' book, apartment therapy website, CRAFTzine & Blanket magazine. Visit Nikki's blog, Whimsy Love, to see more great projects, and her Etsy Whimsy Love Shop to purchase her colorful crafty pieces. In the April Garden Party session of Artist Class, Lilla LeVine will present her gorgeous fabric books for us. These are stunning, multi-layered pieces, and Lilla takes us through the steps to create them ourselves. Another infinitely customizable project, this elegant book is a golden opportunity to use your special fabrics and embellishments. Lilla's fabric books will be featured this Summer in Sew Somerset, and she's written this April tutorial just for us. Been a teacher and fiber artist for many many years. Exibited in many countrys, USA, New Zealand, Australia, Japan, and Switzerland. Indigo garments in NZ and Ribbon embroidery in Australia. I was born in NZ and live in Hawaii. Next teaching classes will be in Long Beach CA at the Int. Quilt Festival July 23 - 25th. Will teach 5 classes. Come and see me. I also produce articles for Somerset magazines and others in Australia. Visit her blog, Just Lilla, to see more fabric books and her other amazing works. One of the beautiful springtime projects in the Garden Party session will be this festive Spring Centerpiece from Beth Leintz. The centerpiece is infinitely customizable, but Beth also includes images and patterns if you'd like to to make one just like hers. This project is fun for a single centerpiece or in a series, and fitting for May Day, Mother's Day, birthdays - any special occasion! It's also a wonderful project for crafting with friends - each person will make it their own. Join us for the April, Garden Party session of Artist Class to learn how to make this one yourself! Three days a week, I use the left side of my brain as a CPA at a construction firm. Weekends are reserved for scouring estate sales and auctions, buying junk and reselling it as antiques at my antique booth, antique shows & on-line. In between, I like to use the right side of my brain for collage, crafts & knitting. I've been published in Romantic Country, Victorian Decorating, Somerset Life, Simply Handmade & Art Quilting Studio magazines. Also- in 1999 I was published in Parade magazine in the Ask Marilyn column. Marilyn asked her readers to finish the sentence "If a man could build a better mousetrap.....". My reply was "he better be willing to empty it". Visit Beth's blog, Gathering Dust, to see more great art!